A Blend of Style and Function. 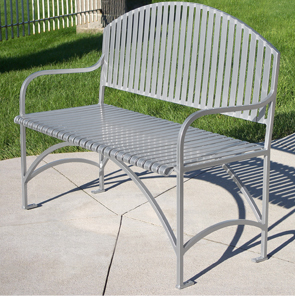 The alluring style of these English Series powder-coated ribbed steel benches will add a great look to any park, patio or walkway. The solid steel construction and powder-coated finish will provide many years of comfort and service. The individual metal slats on the seat have a nicely finished rounded edge that protects the legs and adds comfort. All the flat steel is 3/16" thick. The entire frame is made of solid 3/4" steel rods. 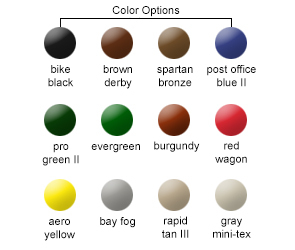 These powder-coated ribbed steel benches ship completely assembled and available in the color options shown below.